theMeanLadyMADISONshow doesn't have any Goodies to view right now. 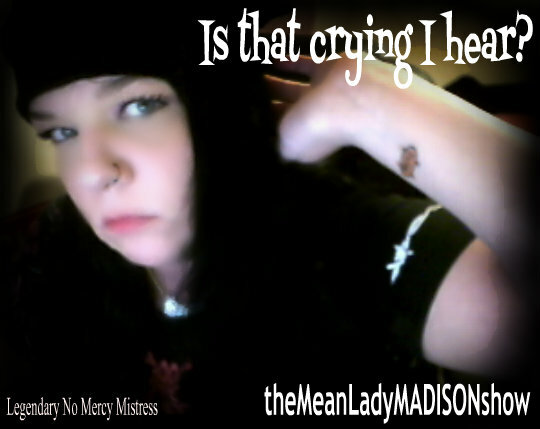 Thanks, we've let theMeanLadyMADISONshow know you're interested in seeing her Goody Bags on NiteFlirt. THE ULTRA DELUXE IN HUMILIATION! ONLY FOR REAL INSULT JUNKIES! & CALL ME RIGHT NOW!! I ALWAYS GET WHAT I WANT! YOU STUPID LOSERS MAKE SURE OF IT!! YOU'RE HERE TO ENTERTAIN ME! !